NRC is pleased to announce the launch of a new oil spill response equipment assistance service for the European Maritime Safety Agency (EMSA) in Oldmeldrum, near Aberdeen, Scotland. Under this contract, awarded to NRC subsidiary Sureclean Ltd, NRC will be responsible for maintaining and storing EMSA’s equipment and ensuring its readiness for mobilisation 24/7 should an emergency occur. 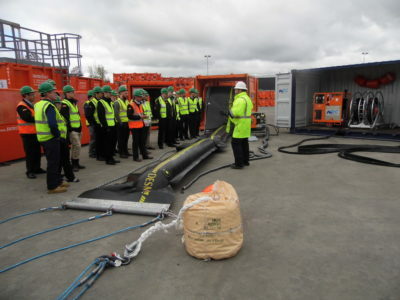 The equipment is dedicated primarily to offshore oil spill response operations within the North Sea and includes fire boom, Current Buster, Scan Trawl and Speed Sweep systems. NRC will manage the operations from its international oil spill hub in Oldmeldrum. This 4.9-acre facility provides technical and emergency response support to the company’s clients and operations around the world and is now also available to support the needs of operators in the North Sea. “We are delighted to be awarded this contract from EMSA. The North Sea is a region of strategic importance to leading global energy players; many of which are clients we have been supporting for a number of years. This project reaffirms the diversity of NRC’s service offering across the range of environmental, emergency and oil spill response, specialist industrial cleaning and environmental waste management in the UK and the North Sea region. We look forward to supporting EMSA and are excited to develop what we believe will be a long standing relationship, committed to environmental stewardship” said Neil Challis, Senior Vice President of NRC. NRC is a global provider of diversified environmental, industrial, and emergency response solutions with over 1,200 staff in offices throughout the U.S., Europe, the Middle East, Africa, the Caspian Region, and the Far East. NRC subsidiary Sureclean is an established international service contractor providing specialist and innovative solutions to the Oil & Gas and wider energy sectors.